Have you tried to use a more powerfull/slalom fin in the board? It is interesting, but you still need to carry sails, boom, masts, harness, fins, wetsuit...... an inflatable board will not change much your need for transport. Ah I forgot the inflatable rig ! This little quote from the link Joe put up had me wondering? The board has good constant speed. It sails through gust and lulls with good control and keeps on the plane. The board does need to be sailed slightly overpowered. 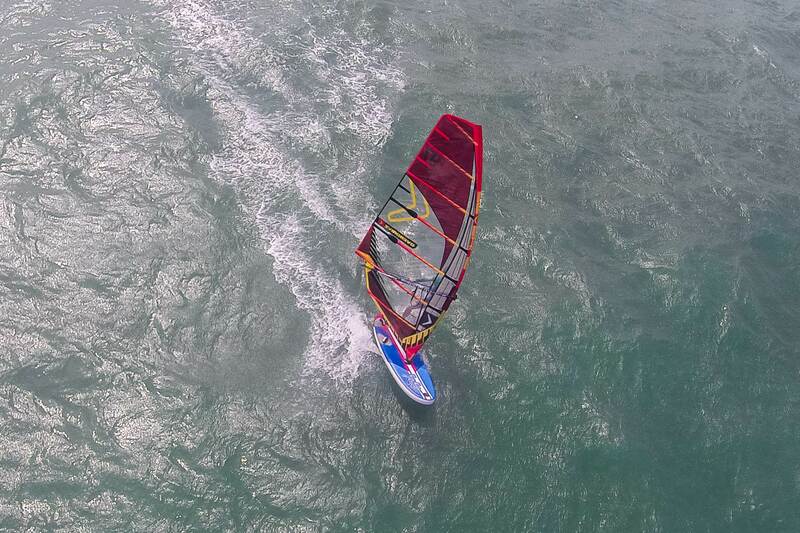 I found between 1 – 1.5 m sail size bigger then normal made the board fully blast along." Is it only the flex that slows it down, or is there some aspect of a fast shape that can't be done in a pump up? If it is flex that might explain why carbon is/feels faster. I had always thought that any extra speed due to carbon construction would be undetectable, that they just felt faster because of the vibrations. I agree, can't see the point in an inflatable sail board - performance looks suspect. There probably isn't a mass market at this stage but I can see a market. For example I lived in Singapore the last couple of years and we used to go on short weekend trips to places like Vietnam, Thailand, Malaysia. Many of those places have ok wind but the logistics of taking a full size windsurf kit on small budget airlines are a complete nightmare. Local rental gear if available is usually decades old and they won't let you use it when it's actually windy. There have been plenty of occasions where this board would have at least gotten me out on the water for an hour or two. Fair point, there must be a market as I guess the manufacturer did his homework first. i understand inflatable sups are big in Europe as a lot of people live in appartments With limited space. The thing with an inflatable sailboard (unlike a sup that needs an extendable paddle) you still need to carry a boom,fin,sail - maybe 2? heavier than a conventional board?? In the end how much smaller is an inflatable board in a rolled up pack? there are pros and cons to each scenario- I guess the market will answer the question. In the end how much smaller is an inflatable board in a rolled up pack? The problem is that some airlines started to insist on using containers for loading. For smaller planes those containers restrict the length of cargo to 190 cm. Jetstar on domestic flights in Australia is one of those airlines for example.